One of my favorite hikes in Los Angeles is the loop trail up to Sandstone Peak and back. This hike through the Santa Monica mountains takes you up-up-up the Mishe Mokwa trail to the summit of Mt. Allen. 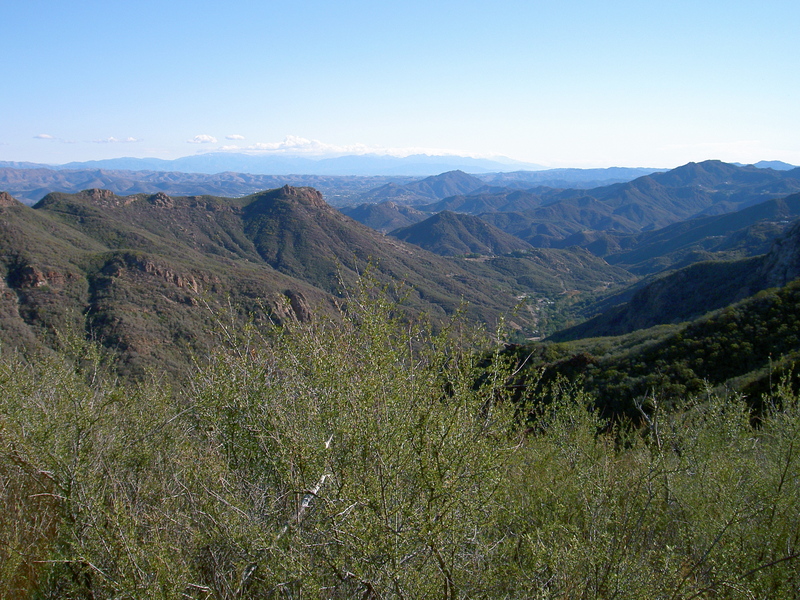 This is the highest point in the Santa Monica mountains, and offers a stunning 360˚ view. You can go back to the parking lot at that point and make it a nice little 3mi hike. Or, you can continue on down to meet up with part of the backbone trail. If you continue, you will go through a scrubland filled with agave plants, a small forested area covered with scrub oaks, and finally, enter a tree-filled glen that has a small stream running through it. This area is also home to Split Rock–a boulder that has broken into three places. If you’ve packed along a lunch, this is a nice place to stop and eat. Once you’ve finished your lunch, you’ll want to retie your shoes. You’re about to do some serious uphill walking. You’ll go up for quite a way, though a tunnel in the scrub oaks. Finally, you break through to a nice view of a rocky outcropping known as “twin peaks”. There’s a great echo off the far hillside, and if you feel like serenading the rock-climbers who are usually at play on it, feel free. Once you leave that area, you’re in the home stretch of the trail. It’s not level, but the hills get a little less intense from here on out. Finally, you’ll loop around to meet back up with the Mishe Mokwa trail, which you can take back down to your car. The whole hike is about 6mi and takes somewhere between 2-3 hours, depending on how long you spend taking pictures, eating lunch, poking bugs with sticks, etc. It’s also quite a good workout. If you feel inclined, you can always stop at Malibu Yogurt & Ice Cream on the way home.